High quality glass fibre Cobra conduit duct rods are ideal for short to long installations into cable ducts. The 9mm, 11mm and 14mm Cobra conduit duct rods come complete with a mobile frame for ease of use and the 4mm and 6mm conduit rod versions are on a free standing frame - all conduit duct rods have high tensile strength for cable and pipe laying contractors. Cobra duct rods are often referred to as Duct Rodders. Pictured : Duct Rods - complete range of diameter and length conduit rods. As underground cable moling technology advances the pulling of fibre optic cables into ducts can lead to conduit shafts of up to 2000m long. Cobra conduit duct rod for ducting cables overcomes cable pulling complications saving time and man-hours. This trenchless method is used for the installation of shorter runs of cable and ducts, pumped sewer lines, water mains, oil lines and gas lines. 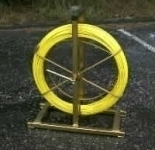 Conduit rods are available with integral Sond devices (Minitran) which detects the location of the rod prior to connecting to draw or winch ropes - these transmitters are propelled along a conduit to locate duct blockages. Conduit rod is a high quality helically wound epoxy rod providing excellent adhesion properties for the outer polyethylene coating. The conduit duct rod construction offers excellent bending elasticity for long and short installations into cable ducts. 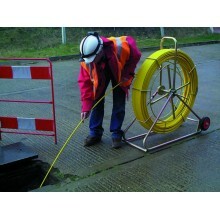 Conduit duct rod is also suitable for installing draw and winch ropes into ducts prior to cable pulling. 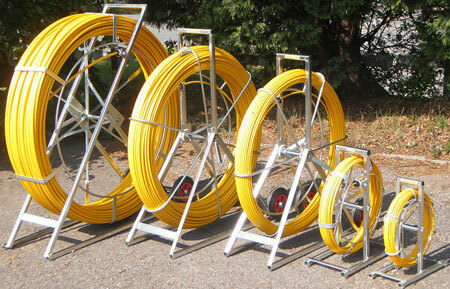 9, 11 and 14mm conduit rods are mounted on a mobile frame for ease of site mobility. 4 and 6mm conduit rods are supplied on a free standing frame. All conduit rods are designed and built for easy handling and are complete with guide tips. Optional conduit rod extras : conduit rod repair kits, swivel connectors and flexible guide tips. Cobra conduit duct rods (often called Cobras, conduit snakes, duct rods or conduit rods) are used in pipe and cable laying operations to assist in the installation of draw ropes, cables and winch wires - conduit duct rods can also be used as part of a CCTV or pipe cleaning system. Cobra duct rods are a more cost-effective solution to using traditional screw together drain rods. T&D distribute the complete range of Cable Pulling and Cable Laying Equipment for low and high voltage (LV-HV) cable installations into underground trench or cable duct.